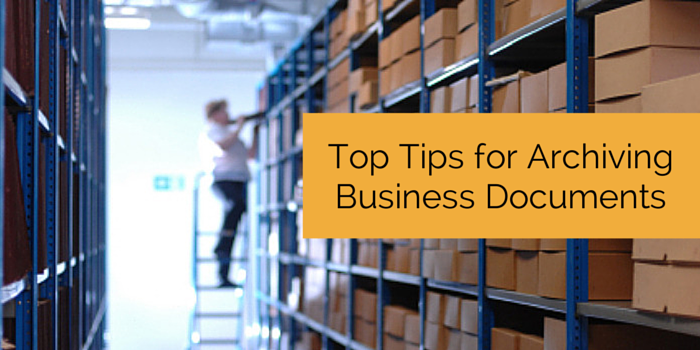 Businesses need to keep an archive of their records. From employee records, to till rolls and tax form, being able to retrieve data when called upon for legal reasons, such as HM Revenue and Customs enquiries is an essential part of running a business. Receipts, cash books, expense claims to name but a few, must be kept for a minimum of 6 years from the end of your corporation tax accounting period. Accident books must be kept for at least 3 years from the date of the last entry. Records pertaining to Wages, National Insurance, Pension etc. must be kept for a minimum of 6 years. Employee paperwork detailing disciplinary warnings, training, redundancy etc. must be kept for at least 6 years after employment ceases. Statutory pay records such as maternity & sick pay must be kept for 3 years. Documents regarding application forms and interviews should be kept for 6-12 months. Below are our top tips to help you comply with these rules, wherever you decide to store your documents. …and don’t mix different types of records just to fill a box. It may seem like a waste of space to not fill each box up fully, but it will make it so much easier to find what you’re looking for if you stick to clear organisation. Plus, believe us, you will fill the boxes up eventually! Don’t store any damp documents. If they go into storage damp they are much more likely to get damaged by mould…which can spread to the documents around them. Dry them out first to avoid such problems. …especially if you are using ground floor or basement level for storage. This will keep them raised off the ground and hopefully dry in case of flooding. It also makes sure that air can circulate around them to aid drying if flood water does reach them. …when it comes to storage and retrieval of documents. This means that you should put the documents that you are least likely to need in first, and the ones you are most likely to need in last. This should help ensure that you can access them easily if they’re called upon. Keep your records secure by limiting access to them. Identify who needs access and, where possible, issue each individual with a unique PIN code to track who accessed the records and when. If you can’t allocate individual PINs then limit the number of keys available and make sure that key holders sign them in & out. Do you have any top tips that we may have missed? Let us know in the comments below!